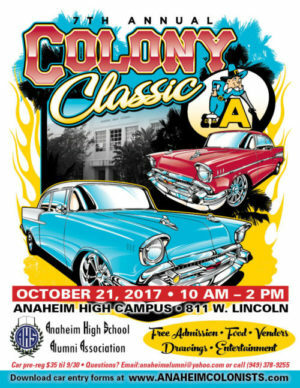 At Paul Kott Realtors, our employees love to give back to their community, which is why we’re happy to announce that some of our realtors are sponsoring Anaheim High School’s 7th Annual Classic Car Show on Saturday, October 21 from 10 a.m. to 2 p.m.! While cars will be the center of the event, Paul Kott Realtors will also be collecting donations for a documentary that’s being produced about the 1956 Anaheim vs. Downey CIF Championship titled, A Last Hurrah. The film will focus on the 1950’s golden age of high school football against the backdrop of the economic, social and cultural transformation of Southern California. The alumni of Anaheim High School, including our very own Paul Kott (’72), is trying to reach a fundraising goal of $25,000. We at Paul Kott Realtors want to make sure that they reach their goal, which is why we are collecting donations at the Classic Car Show this Saturday. For every donation made, we will match it, dollar for dollar. However, that’s not the only way you can give back – if you sell or buy a home through Paul Kott Realtors between now and June 2018, Paul Kott Realtors will donate $500 toward the film. Think about it: you’ll get your dream home, and you’ll be part of making a movie! We hope to see you on Saturday at the Classic Car Show, located on Anaheim High School’s Campus. To learn more about this event or the film being made, contact Jackie Garibay (jgaribay@pkrealtors.com or 714.747.3717) or Debbie Esquivel (ochomesbydebbie@gmail.com or (562) 397-5491).